How is it possible that one town can have so many picturesque doors? On a sunny Sunday morning this past May, I headed out from my B&B in Orvieto, Umbria on a photography expedition. I was looking for interesting and beautiful street subjects for future paintings. And hopefully, I would come across some doors to photograph, as doors are a special painting passion of mine. Within a few minutes, I had already taken dozens of photos and found many gorgeous doors… and windows and balconies. I was so impressed with how this town took such pride, not only in the maintenance, but also in the beautifying of its buildings. The medieval structures have seen a lot of history and have no doubt been patched up innumerable times. 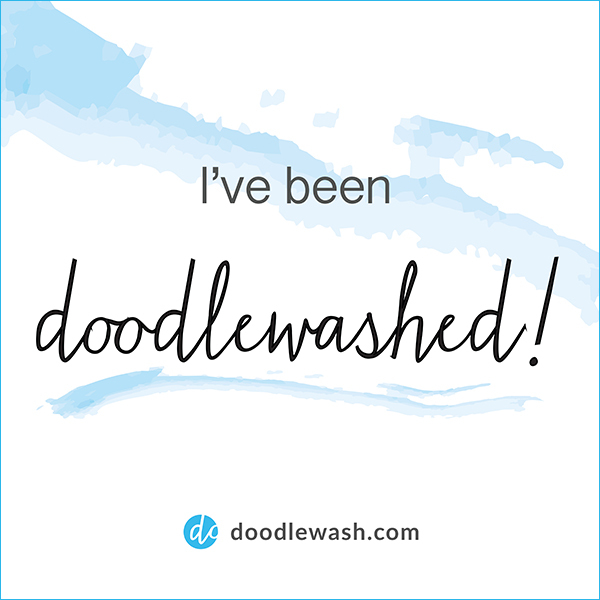 Yet, restore a weathered door, add some flowering and climbing plants, and even toss in a lemon tree, and the worn buildings take on an irresistible charm. I’ve come away from this one morning’s walk with so many new photo subjects that I could be painting Orvieto well into next year! So far, here’s my start. At the western end of town, I came across a very steep street that I would have to climb called Via del Caccia (Hunter’s Way) to get back to a main street. I wasn’t looking forward to the exercise, but I was rewarded as this turned out to be one of the prettiest streets I’d seen. About a third of the way up the street is this lovely door. 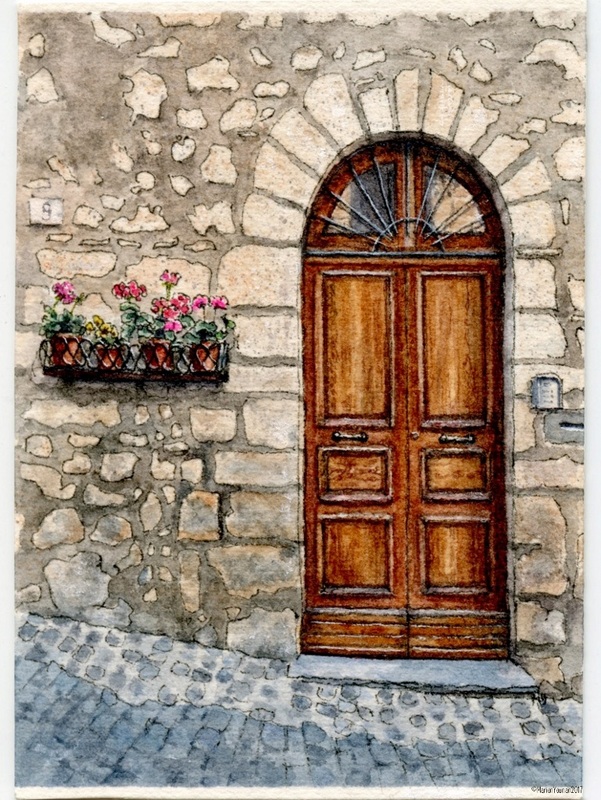 From the photo, it has become Mini piece #76, “Orvieto Door”. A few hours (and many photos later), I had made my way to the eastern edge of town where I had a well-deserved cup of raspberry sorbetto, leaning against a building in the shade. From my vantage point down a side street, I could see a large, multi-tiered building with vines covering part of it and lots of terracotta pots lining its front and side. My next photo shoot! I slurped down that sorbet very quickly (brain freeze!!) and headed towards this gorgeous building. Again, it was very old and crumbling in places. One of the doors looked almost like it had been on a fortress – heavy, studded, and certainly on its own would seem to say “Stay out”. But surrounded with flowering pots, climbing vines, and a number of lemon trees, its demeanour seemed to dramatically change to “Stay awhile” and “Appreciate my beauty”. 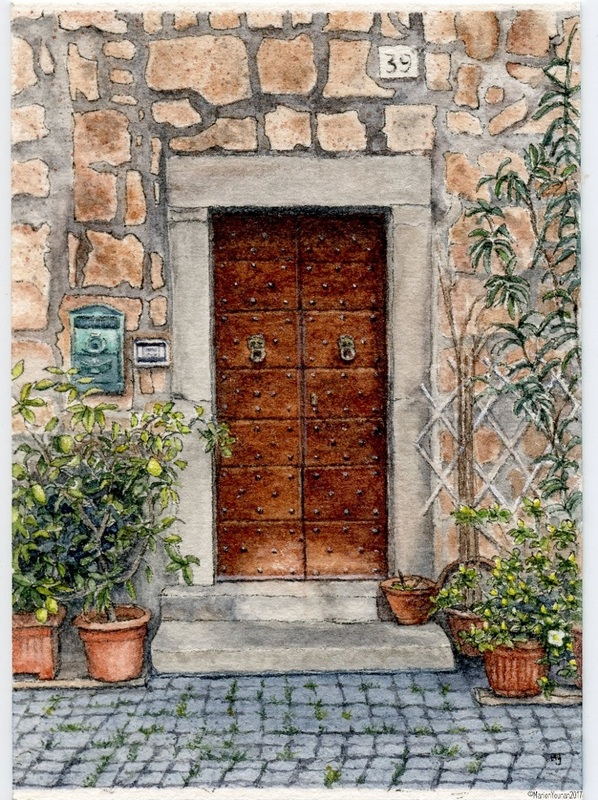 Ecco, “Lemon Tree Door, Orvieto”, Mini #77. 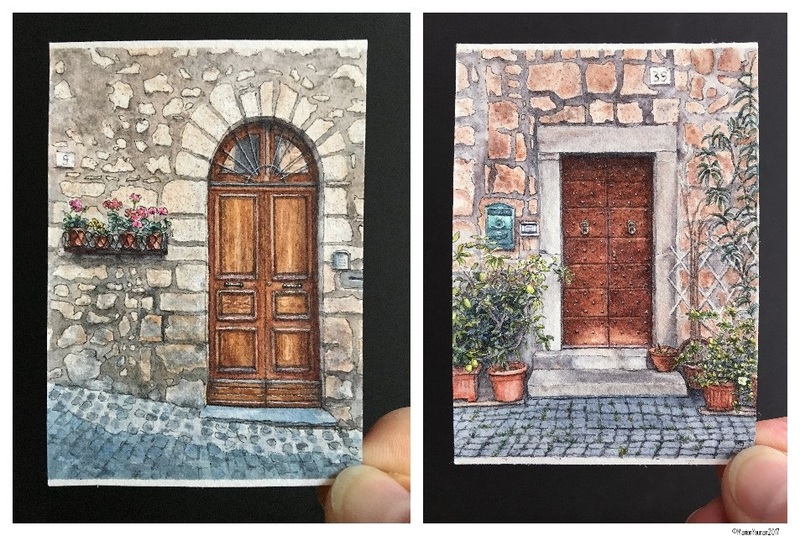 I believe I have 38 other possible door subjects from Orvieto that would make fine miniature paintings – who knows how many more I’ll do but there are sure to be a few more! And consider adding Orvieto to your Italian itinerary, if you love doors, too!